Whiteboard Coder Off-TOpic: How much will my monthly benefit go up next year if I work this year? How much will my monthly benefit go up next year if I work this year? My family recently had a medical scare with my father-in-law. After a lot of prayer and lots of doctor's visits he is back home and doing well. As a result of this brush with mortality my in-laws have let me into their financial planning some, so that if the worst may come to pass I can better help my mother-in-law with her finances. As a result of all this I am learning about Social Security and what it pays out in benefits. My mother-in-law is fairly sure she is going to live into her 90s so she delayed taking Social Security until turning 70 (which just happened this last month). My Mother-in-law is a rare bird. You would not figure she was 70. She works 50-80 hours a week at her job and makes good money at it. While I was helping her with her finances I looked at her paystub and saw that Social Security was still coming out of it even though she was now taking full social security. I wondered if this was normal…. turns out it is. In fact it turns out if you are working while taking social security your new earnings may increase your S.S. benefit in the following year. So how much of an increase in S.S. monthly benefits can I expect next year if I keep working this year? I have dug through lots of Social Security pages and I have the answer (or at least a close enough answer). Here is the equation to figure out how much more S.S. income you will get next year for the earned income you make this year. That is nice and all, but what does it all mean? You will get a page like this with Years and Factors. Now what do you do with this? You take your Social Security income for that year and multiply it by this number. As an example, let's say your 35th lowest earning year (after using the indexing factor) was 1959 and you earned income that year was $2,500. Using the indexing factor of 8.8347295 your LOW would be $22,086.00. This would tell you that to increase your S.S. benefits next year (beyond the cost of living increase) you would have to earn more than $22,086 this year. If you have fewer than 35 years of income, which is the case for my own mother, any money you earn this year will increase your benefits next year. 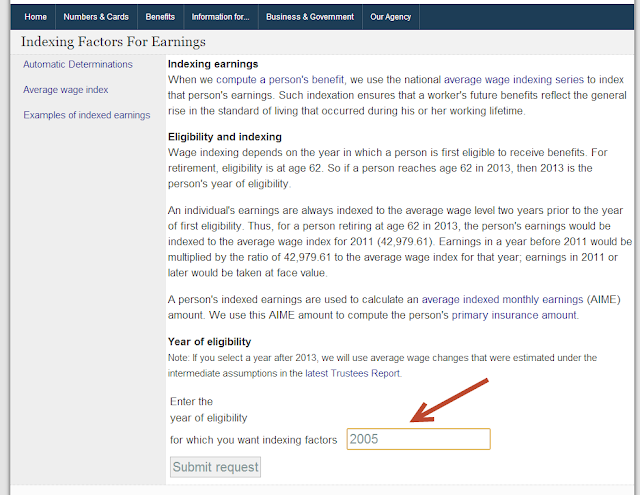 The cost of living adjustment is compounded annually by the next cost of living adjustment. To make life easier I made this cheat sheet for you which is accurate for 2013. Social security has income brackets that reduce the amount they pay you, per bracket, if you made more money in your life. The first small bracket pays you 90% the second pays 32% and the 3rd bracket pays 15%. Although the bracket percentages do not change 90%, 32% and 15% the money amount does change based on the year you turned 60. But this cheat sheet is still hard to read so I made another one that I think is simpler. 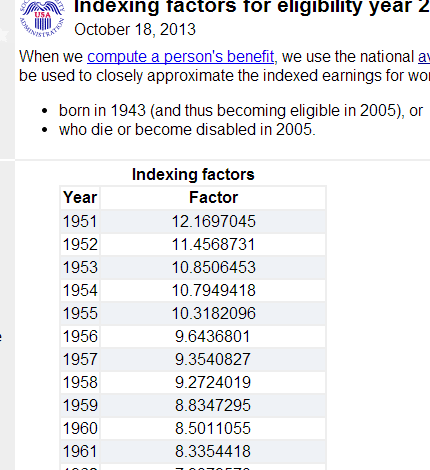 Look at the monthly income brackets for the year you turned 62. For the case of my mother-in-law that is 2005. That gives me a 1st income monthly bracket of $564 and 2nd income bracket of $1,573. Take these numbers and multiply them by your ColaF number and then by RA number. In the case of my mother-in-law her ColaF number is 1.244 (assuming 2013 has a cost of living adjustment of 1.5%). Her RA number is 1.32 because she waited till 70 to take full S.S. retirement. Multiply your 1st bracket income and 2nd by this number. your bracket will be 0.15. Note: Make sure you are looking at what social security pays you before they automatically take out any medicare or taxes. Again here is the equation. I don't want to reveal my mother-in-laws current income but her current income subtracted from her 35th lowest income year adjusted with her indexing factors is $48,067. This tells me that she will make an additional $60.13 per month next year from Social Security for the work she did this year. That is not to be confused with the boost she gets next year because of COLA for 2013 predicted to be 1.5%. 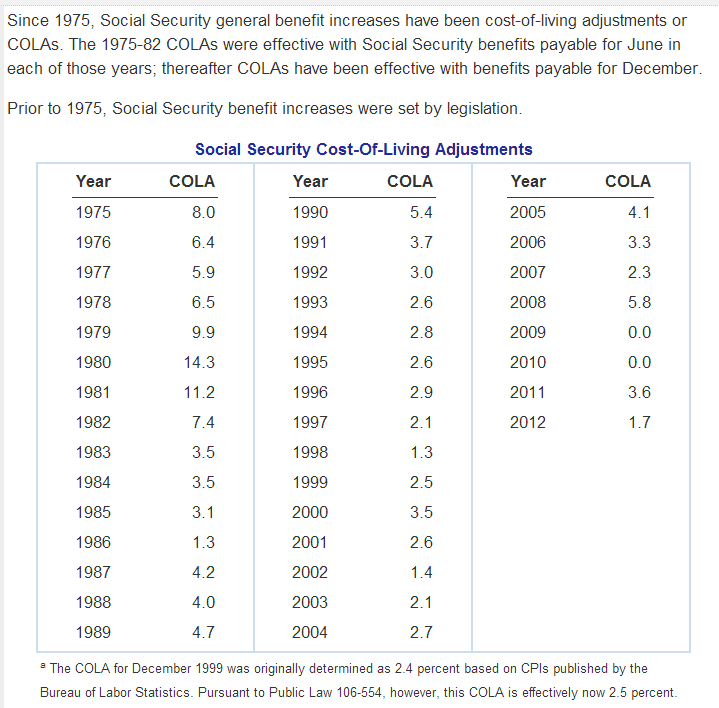 The COLA for 2013 is just a cost of living adjustment she would get if she had earned income this year or not. I will post on here again in January to see if my calculations were right. Hope someone finds this post useful. And for those of you working past your retirement age, my hats off to you this country needs more people like you.